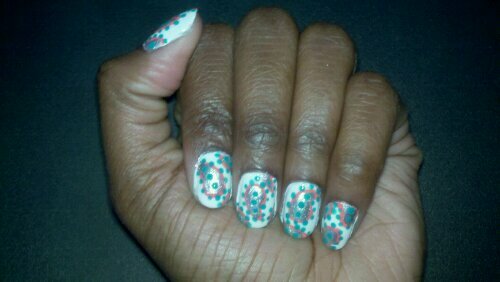 For this look, I was inspired by this pants suit featured in Gucci‘s runway show in Milan for their Spring 2011 line. 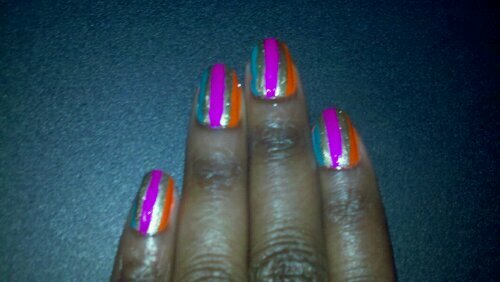 When I was looking for inspiration for nail art, this look stood out among many of the other spring/summer fashion lines I googled. This suit in particular covers so many trends in such a fun and classy way: it’s menswear-inspired; the high-waist, tapered leg of the pant is reminiscent of the 70s as are the 70s-glam-inspired clutch/belt; and the colors (which are color-blocked – another spring/summer trend) are both flattering and fashionable for the season. Are there any other trends that I missed? There is a lot going on this this look but I think Gucci pulled it off incredibly well. 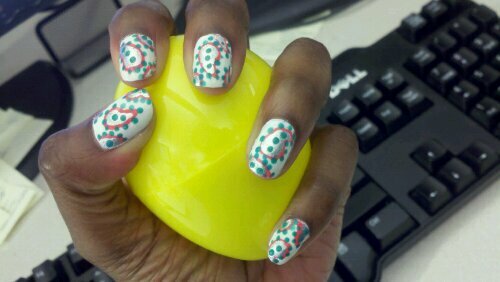 This nail design was an intentional optional illusion (unlike the Two Spring Trends In One post). I wanted it to look green/gold from one side, orange/gold from the other, and all 4 colors when viewing it directly from the top. 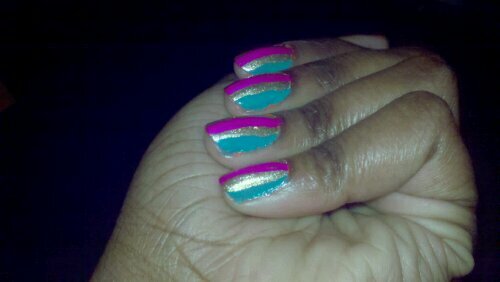 I used Orly Green With Envy and Luxe (for the gold stripes) and China Glaze Orange Knockout and Purple Panic. P.S. I recently purchased CND’s Stickey base coat and Super Shiney High-Gloss top coat. This is the first blog post where I’ve used a different base and top coat than my traditional Orly Bonder and Seche Vite Dry Fast Top Coat…I’ll have to see how they hold up. 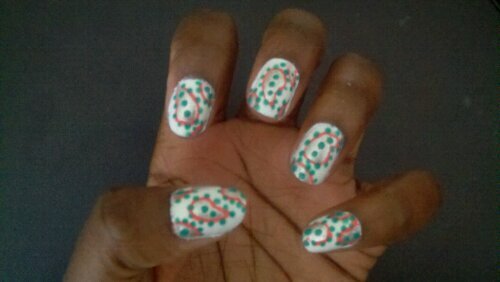 This spring I’ve been looking to fashion trends for inspiration for my nail designs. 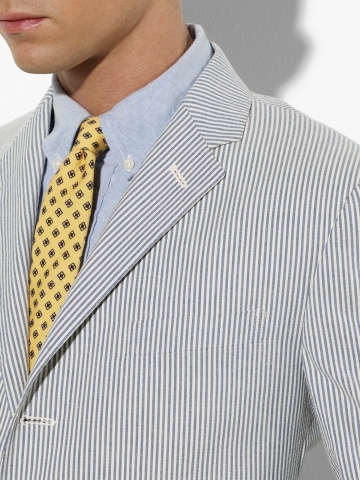 I happened upon a You Tube video for H&M’s Spring 2011 lookbook that had cool-toned spring colors, neutrals, and stripes…classic spring trends. Below is summary shot of some of their looks. 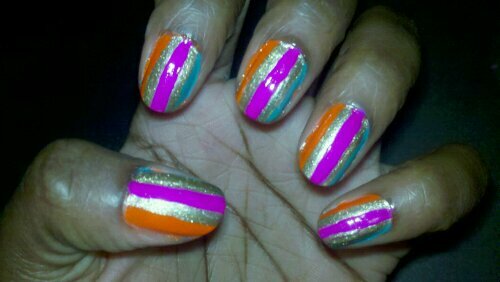 For this mani, I was inspired by the 2 looks on the right: the striped skirt and the long flowing dress. 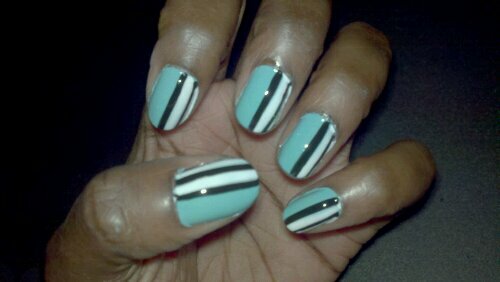 So I painted my entire nail using China Glaze’s For Audrey, quite possibly their most popular shade ever, and used 2 Art Deco Nail Art Stripers in Black and White to create stripes on one half of each nail. 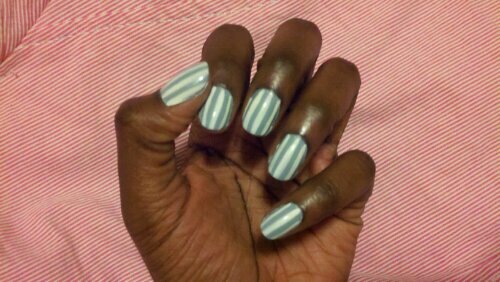 Let me tell you, this mani has gotten a lot of positive feedback because of the (unintentional) optical illusion effect that occurs when people view it from different angles. I can’t wait to play with this effect in the future! 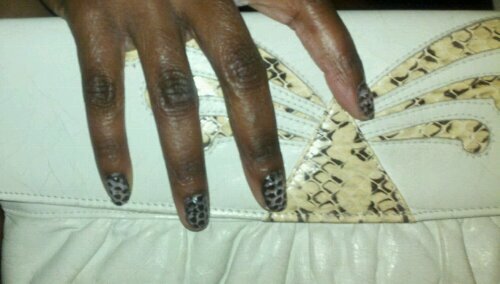 More spring-trend inspired manicures to come!!! 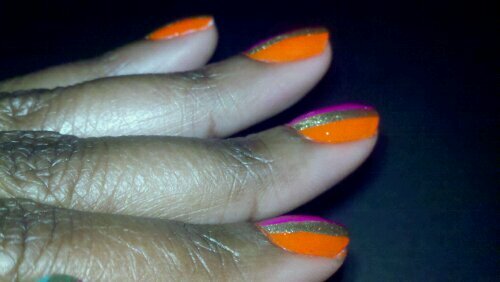 Spring is beginning to spring so I think this cheery manicure is right on time! I went crazy with the dotting tool and added lavender, silver and white dots in diagonal lines on top of a dark lavender color. 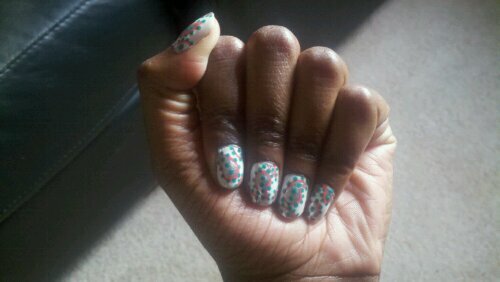 Who doesn’t love a good polka dot pattern? 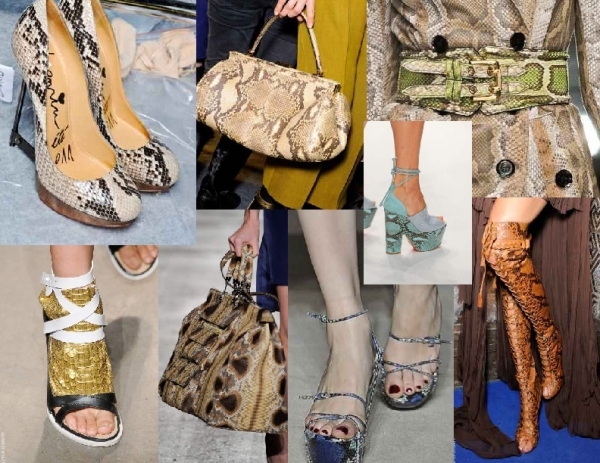 You don’t have to stick with the traditional colors for your leopard print design…in future posts, I’ll show you more fun color combos while keeping the leopard print design.